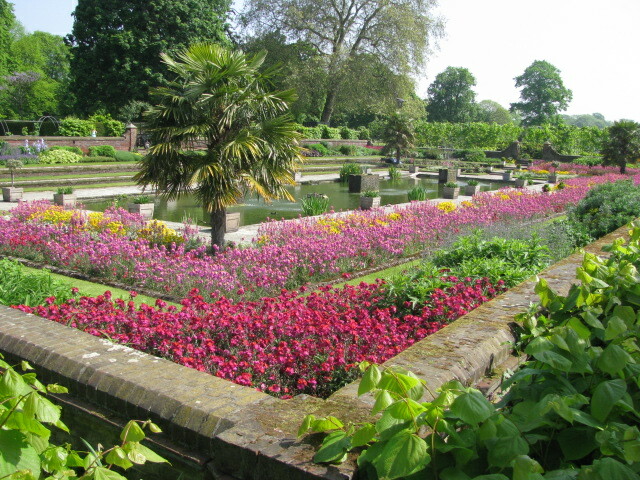 This photo of the sunken garden outside of Kensington Palace was taken last spring. I wandered by there last weekend and it looked nothing like this. I’m hoping the flowers will start to bloom soon. This entry was posted in Travel, Travel Photos and tagged 50 Year Project, Blog, Blogging, England, Kensington Gardens, Kensington Palace, Life, London, Nature, Photography, Spring, Spring Flowers, Sunken Gardens of Kensington Palace, Travel, Travel Blog, Travel Journal, Travel Photo. Bookmark the permalink. Lets hope! Anyway should be summer tomorrow! I’m not surprised it doesn’t look like this. Last Spring was lovely but this year – Snow. Poor plants don’t know what to do – they’re just starting to tentatively peek out from the ground. Colorful photo. Spring is here. Is that a palm tree? Is Kensington Palace in England – like where there are harsh winters with snow, sleet, freezing temperatures and all? Palm trees don’t often do well in such weather. Do they wheel it inside for the winter? I’ve seen a few around my neighborhood and they stay out all winter. Not sure what type they are, but they seem hardy. As a Californian I was quite surprised when I first saw them. This is pretty. Maybe you should take the picture over there to remind the flowers what they are supposed to be doing! They do need a nudge. Amazing picture, calls for summer. We all are. It is beginning to look like spring. So that is a positive sign. I read your book review on J.M Cotzee. Do you like his writing style? I just finished reading ” Imaginings of sands” by Andre Brink, another South African writer and I loved it. which books can you recomend by Cotzee? I do like his writing style. The subject matter is difficult, but his writing is excellent if that makes sense. I’ve read four books by Coetzee: Disgrace, Youth, Waiting for the Barbarians, and Dusklands. Disgrace and Waiting for the Barbarians are difficult to read, but are excellent if you can stomach the violence. I wasn’t a huge a fan of Dusklands. Youth is a brilliant novel. Depressing, but not too hard to take. However, if you are looking for a novel that takes place in South Africa, Youth is about a young man who leaves South Africa and moves to London. It depends on what type of reading you are interested in. I have six more novels by him that I plan on reading–then I can provide a better answer. Haven’t read Brink’s novel but will look for it at the library. Interesting. After reading your post about the book review. I got curious. I went to the library and borrowed Summertime by J.Cotzee. The book received a Nobel prize. Have only read a few pages so far, one gets a glimpse of who John .C was while living in Cape as a budding writer.In the book there are some references to Duskland. So maybe after summertime Duskland should be my next read. happy reading! I’ll look for Summertime. Youth also offers a glimpse of what John C may have been like as a budding writer. It would be interesting to compare the two. Thanks for letting me know. I have been sceptical about S.A white writers from The Apartheid era hence I have never read neither Brink nor Cotzee until now. I must say, I was really suprised by Brinks criticism on Apartheid and the fact that he was anti- apartheid. I guess with my history, I never believed there were any whites who condemned what was happening, especially Afrikaners( the white farmers. So, what do you know. It’s understandable that you were, and probably still are skeptical of some writers, since you are closely connected to the time and place that they write about. Such a difficult time in South Africa’s history and it’s still fresh in many minds. I would like to learn more about this time period. Do you suggest any other writers? I will check and let uou know. Oops! when you asked what is he wearing. I thought you were referring to the another picture. I think the old guy is wearing a woolen coat. I do not know what is the big metal thing. Big metal thing is a perfect description 🙂 I hope all has been well. I have been busy writing my final project. Time consuming. Now I have four exams left: That takes some time from blogging, hence the lack of daily posts. Hope you are well. lucky you. I cannot wait to graduate. We woke up to snow and cold today. Where is spring? Again. This has been a long winter for you folks.